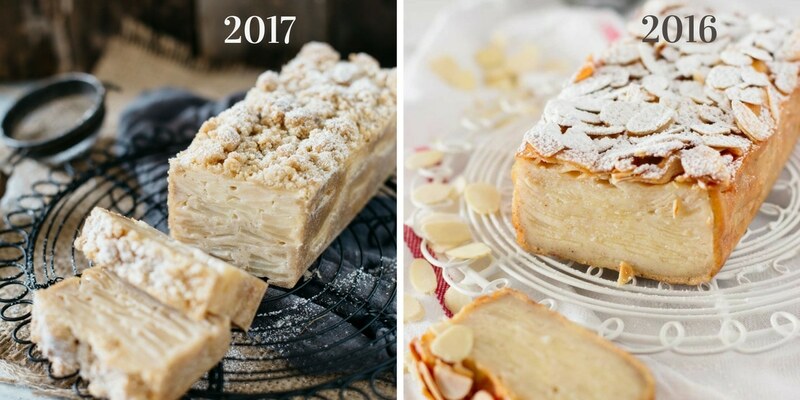 I originally shared with you my “Invisible Apple Cake (Gateau Invisible)” last February when this style of cake was taking Japan by storm. The rainy days we are having at the moment reminded me of this invisible apple cake, because I love baking in this sort of weather. 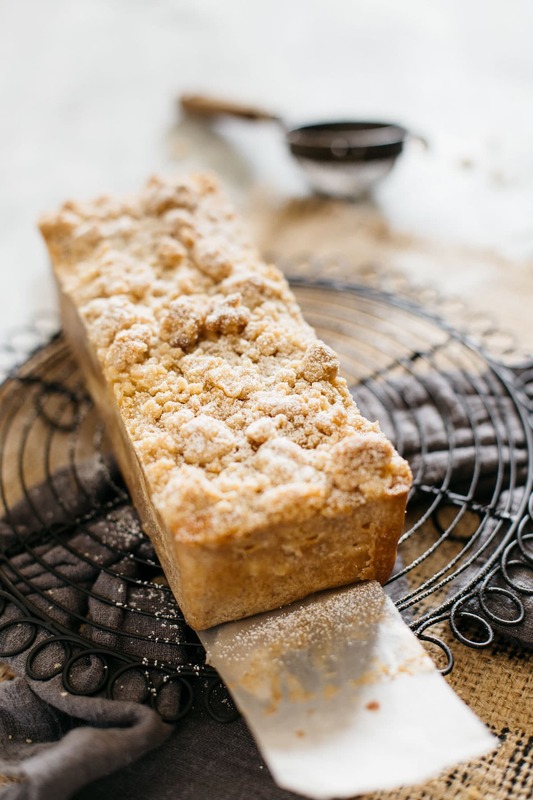 This time I have baked a Gateau Invisible Apple Crumble Cake, and instead of topping the cake with sliced almonds, I sprinkled it with a delicate and delicious crumble. It turned out just as delicious as it looked! I often browse online to see what types of food are trending in Japan, and this beautiful and cleverly named French cake caught my eye. Although, I did not see anything like this when I visited Paris this time last year — and I would have bought a recipe book if I had seen any! This cake is referred to as an “invisible cake” because of the thinly sliced apples that are baked into the cake batter. The layers of apple become somewhat invisible (unless you are looking hard to spot them!) I sliced my apples about 2 mm thick last time, but I thought it might be better if the apples were a tad thicker this time. I thought this because that way the apple slices won’t break easily when combined with the batter mixture. Any apples are suitable for this cake, but I think varieties like Pink Lady and Fuji apples would be better because of their firm and crunchy texture. Because I increased the thickness of the apple slices in this recipe, they are a little more visible than last time. In my original post I used a slicer to create those paper thin 2 mm slices, but this time because I was using slices that were approximately 3-4 mm thick, I decided to cut them by hand. 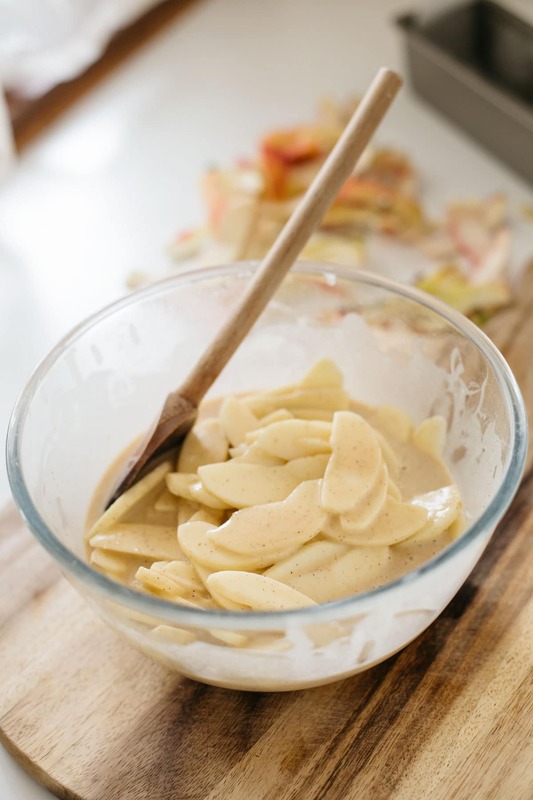 If you decide to slice your apples super-thin (like in my original post) you will need to be very careful when coating your apples with the batter, try not to break the apple slices into pieces. I also decided to use a narrower pound cake pan this time so that the cake will be look taller and more impressive! My pound cake tin was 8 cm wide x 20 cm long x 6 cm in height. A strip of baking paper should line the bottom of the tin so that the cake can be removed from the tin easily. 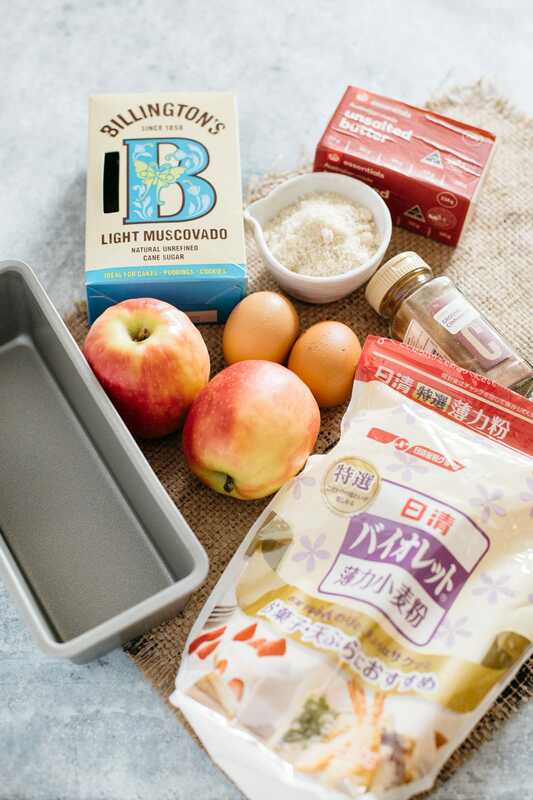 When you pour your apple cake batter mixture into the tin, make sure you line up the sliced apples in the same direction so that when the baked cake is sliced, the apple layers look beautiful. While the invisible apple cake is delicious warm and fresh out of the oven, it slices much better after it has cooled down and been refrigerated for at least two hours. The texture of this cake is very moist, and because there are a lot of sliced apples mixed in, it lowers the amount of calories in the cake! We enjoyed this Gateau Invisible Apple Crumble Cake on a rainy Sunday afternoon. 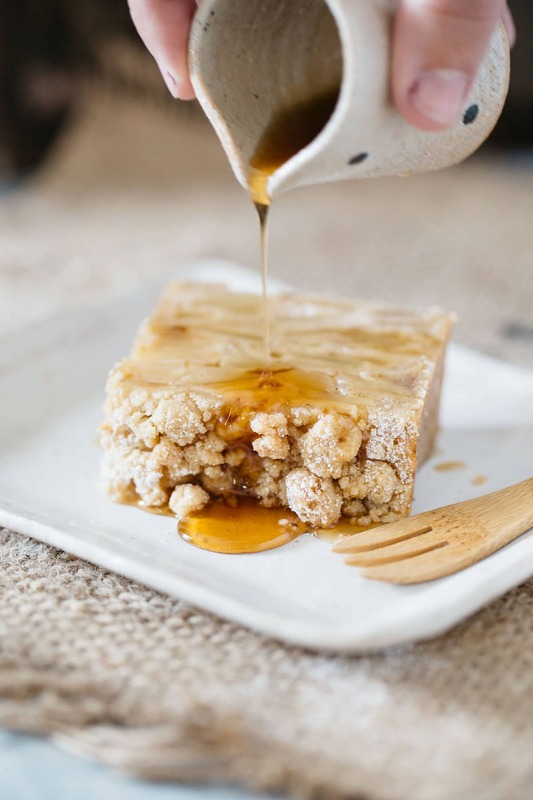 This recipe is very easy to make, looks fantastic, and is super delicious. 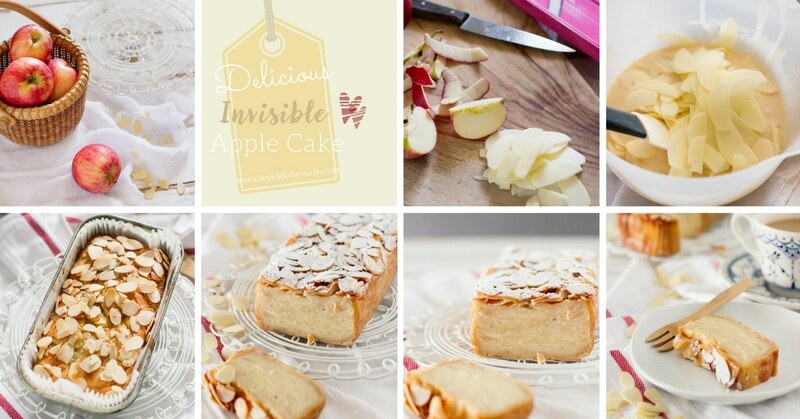 If you liked my recipe for Gateau invisible apple crumble cake, please rate it and leave a comment below. Also, don’t forget to follow me on Youtube, Pinterest, Facebook and Instagram to keep up to date with all the latest happenings on Chopstick Chronicles. Don’t forget to use the hashtag #ChopstickChronicles so I see your wonderful creations! To make the crumble: Place the flour and almond meal in a mixing bowl. Add cold diced butter into the bowl. 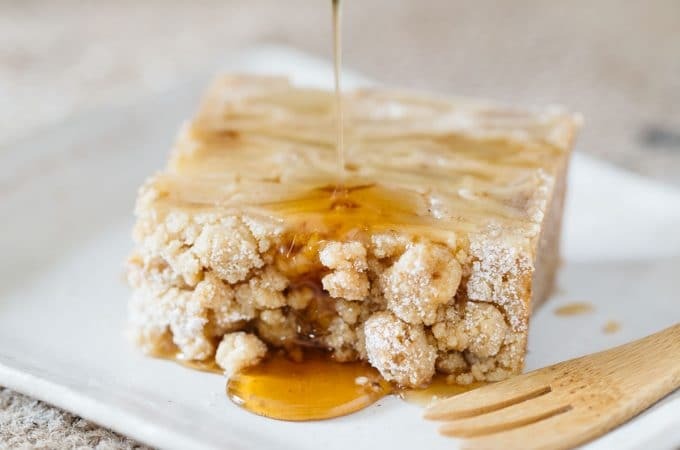 Combine the butter with the flour and almond meal by squish and rubbing together with your fingertips to create a crumble or breadcrumb like texture. Wrap the crumble mix with cling film and keep refrigerated until needed. Prepare the baking tin by spreading a little unsalted butter thinly around the pan, then dust with about ½ tbsp. of caster sugar. Line with 8 x 36 cm baking paper strip along the edges of the pan. Preheat the oven to 180 Celsius degrees (350 Fahrenheit). Place the egg and sugar in a large mixing bowl and combine. Add the cinnamon and flour into the mixing bowl and mix together. Add the milk a small amount at a time, ensuring to stir well after each addition. Add the melted butter to the mixture and mix well. Slice the apples thinly (3 – 4 mm) and add them carefully into the mixture. Coat the apple slices with the cake batter using a spatula in a gentle folding motion. Make sure not to break the apple slices into smaller pieces. Pour the mixture into the prepared tin, lining up the apple slices in the same direction (this will make the cut surface look pretty for presentation). Sprinkle the crumble over the cake and bake it for about 40 minutes. One cooked, take the cake out of the tin and let it cool down for a few minutes. Refrigerate for at least 2 hours before slicing the cake to allow the cake to cool completely. Sift the icing sugar over and slice to serve. *Serving suggestions Serve with your favourite accompaniment such as vanilla ice cream, mascarpone, fresh cream, miso caramel, maple syrup etc. There is no sugar listed in the ingredients, aside from icing sugar for dusting. But it’s written in your instructions. What is the amount of sugar to use? Tried this cake and it didn’t seem to rise or bake very well. This cake does not call for any baking powder or baking soda so how do you get it fluffy? Mine was only about an inch high and not fully baked through. We followed the recipe and instructions to the letter. How did you get yours to fluff up? I’ve just popped this into the oven. Cannot wait to try it! Super excited! Hi Danette, I am excited too 😀 Let me know how it turned out. We loved this dessert! Will definitely make it again. I’m going to try and tweak it a bit to be diabetic friendly. Thanks for sharing! Wow From South Africa 😀 Thank you !! This is a lovely recipe. For me, the baking time was closer to 1:20 minutes. There was too much resistance from the apples before then. Also, I cut my apples 2mm thick, and I felt that was almost too thick. Next time, I think I would add some additional sugar. It could be a tad sweeter, and I was thinking of sprinkling the slices with some sugar and using a torch to brûlée it. Two days out, and my experience is this is something best consumed on the day it is made. It does not get better as it sits. Also, my husband who is not a fan of sweets, thought that there needed to be more sugar in the recipe. Shihoko, this looks amazing, so moist, so delicious. 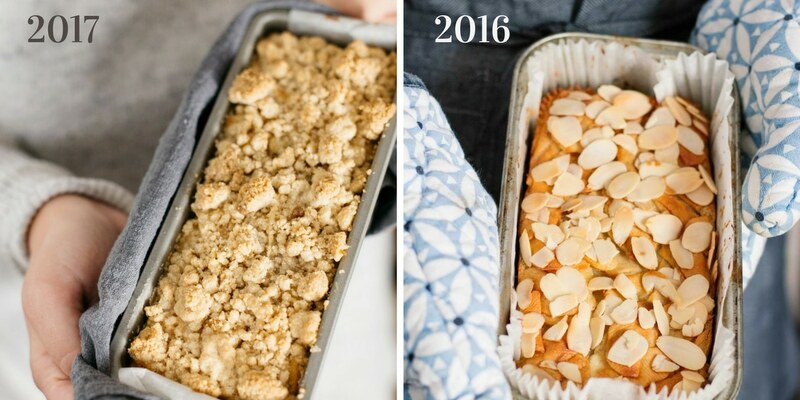 I will certainly try to make it, as apple cakes and pies are still my favorite. Thank you Marinka 😀 I love any apple cakes too! I so wish this recipe was converted to US measures…I am going to try making it but I am not sure about the conversions! Wish me luck…it looks amazing! Arigatou Gozaimashita, Shihoko-san! My parents had a surplus of apples, and I have friends who are moving to Japan, so I made this for them last Saturday. They loved it! So easy and delicious! Please keep up your good work! How do you refrigerate it? On a plate, uncovered? Greetings, Shihoko-san! I have been following your blog for only a short while now, and I must say that I am very happy to have found it! Beautiful photos, engaging writing, and wonderful recipes. I now make the Milk Bread regularly… I enjoy your recipe more than others I have found. Question – For the invisible apple cake crumble topping, what are the proportions of butter, almond meal and flour? I think I checked the recipe thoroughly, but am unable to find the amounts required. Thank you! Konnichiwa Mery san. 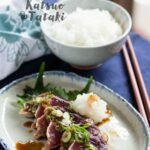 Thank you so much for your kind words and I am glad that you enjoy making Japanese recipes on my blog 😀 whoooops my bad, I will fix it right now. Amazing Shihoko! It’s such a fresh change from a standard plain cake. Will be using this recipe well into the future! Hi Shihoko! This recipe looks delicious! Any recommendations where to buy a thinner, long loaf pan? I love the shape it creates but haven’t been able to find one in the the States. Thank you for the recipe! I was looking for a sponge cake-like recipe but found this and I’m making it instead 🙂 I’l met you know how it turns out. Hi Violeta, hope it turns out great for you 😀 I have Birthday cake recipe, check it out too! 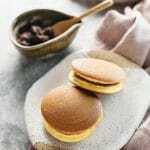 Japanese sweets are so delicate, fluffy and delicious. 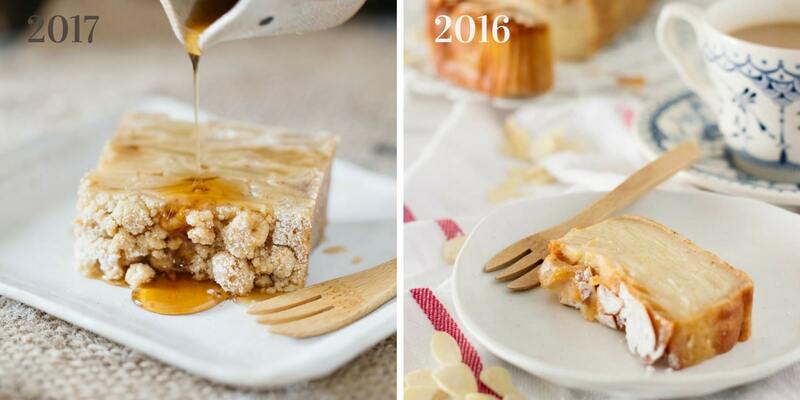 Hello, by any chance is the original version (2016) of this recipe on your site? It looks like something I would want to try first if possible. 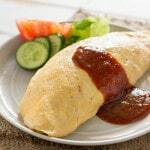 Hi Joyce, I have not changed the recipe but reshoot the photos. Well, I changed the topping but that’s the only change and Apple sliced thinner in original. Tried the recipe, and we love it! But the apples floated od top and most of the batter sank to the bottom of the pan. Why did that happen and how to prevent it? Hi Lorna sorry to hear the cake did not turn out what it should be. What type of apple did you use? May be the apple was a little dry?